The existing park structure that is slated for replacement as the next phase of Centennial Park upgrades gets underway. The red curved slide has already been removed for safety reasons. The playground in Centennial Park will be replaced this summer, as the second phase of the park’s upgrade project begins. 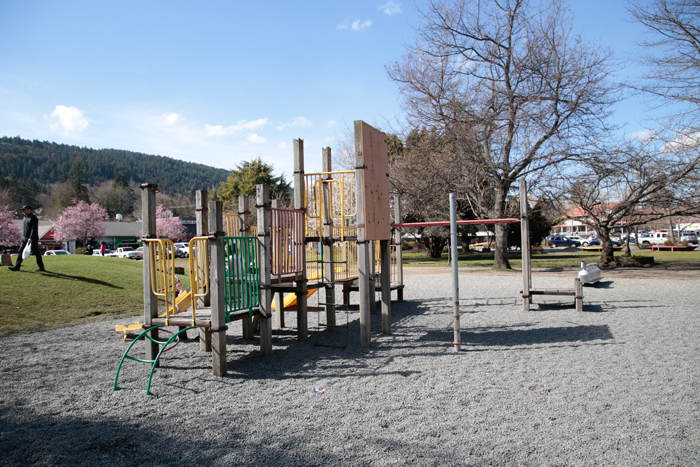 Now that the washroom portion of the plan is nearing completion, the island’s parks and recreation department will be consulting with various community groups about the look and feel of the new playground, as well as specific features that the community may be interested in. “We want as many people as we can to give input . . . Centennial Park is kind of our central hub, so we want to make sure it reflects Salt Spring values,” said Dan Ovington, parks and recreation manager for the CRD. Thanks to a $100,000 donation from the Salt Spring Lions Club, the playground project’s budget has been doubled. Initially, the Parks and Recreation Commission earmarked $100,000 for the playground portion. Since the entire park is built on fill, any upgrades will need additional drainage put in, along with properly engineered footings. The extra money from the Lions gives PARC more flexibility for the playground. The project is expected to be finished in August, with community consultation happening within the next month. PARC has planned a pop-up session in the park to get people’s feedback on April 20. That input will help finalize the design, which will be approved by both PARC and the Lions Club before construction begins. Postponing the project until after the Saturday market season was contemplated, but since the current playground is falling into disrepair, it was decided that completing the project sooner was better than later. Work will occur during the week, and the impact to the market will be minimal. “We had to remove the slide earlier this year just because of safety. A lot of the structures that are there are at or near the end of their life,” Ovington said. Some parts of the existing playground, such as the historic rocking horse, will be kept in the new design. The CRD will also discuss materials used for the ground surface, with an eye on longevity and affordability. No demolition date has been set, but the playground will stay up for as long as possible to minimize the time that kids have to go without a place to play in the park. No trees will be removed from the site, said Ovington, with the design incorporating existing trees. For more on this story, see the Mar. 27, 2019 issue of the Gulf Islands Driftwood newspaper, or subscribe online.